Indian State Park petroglyph site. I’m on vacation this week and I wanted to share a postscript to an earlier column I wrote on the Fremont Indians. I had a chance to stop at another Fremont site on my way to Iowa, this one at Fremont Indian State Park near Sevier, Utah at Clear Creek Canyon. The site was discovered during construction of Interstate 70, and thousands of artifacts have been excavated from the ancient village and put on permanent display at the museum there. The Fremont Indians lived from about AD 400 to 1,300 in north and central Utah as well as in parts of Nevada, Colorado and Idaho. They were hunter-gatherers who were influenced by the Anasazi, who introduced corn and pottery which made it possible for them to settle. 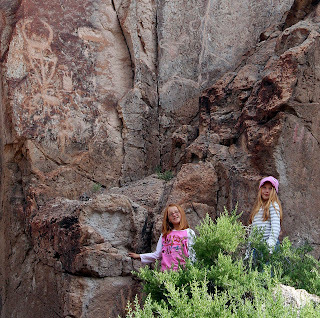 Clear Creek Canyon was rich in food resources which meant they spent less time hunting and gathering and had more leisure time which they used to make jewelry and other items to trade with other tribes and gave them time to create the rock art that adorns the cliff-sides today. The Fremont diet consisted mainly of corn, beans and squash which was harvested and stored in granaries. They supplemented this with wild grasses, nuts and berries as well as an assortment of animals such as deer and rabbits. The granaries were made of rock and adobe, and were designed to keep out vermin and protect the harvest. While some granaries were built near their homes, others were hidden away in remote locations, often high up on the cliff sides in order to protect the grain from being stolen. that can be seen at Fremont Indian State Park. The artifacts found included arrowheads, pottery, and grinding stones called manos and metates used to grind their corn into a course meal. Analysis of the teeth of the Fremont indicates that their teeth were badly worn, likely from eating corn flour with bits of rock that wore off during grinding. The Fremonts are often compared to the Anasazi, whom they traded with. Although they lived in the southwest at the same time, there are some significant differences. The Fremonts lived in single-room pithouses and lived in small villages. The Anasazi built larger houses, often multi-story, and they lived in large villages with many families. The Anasazi also built round, ceremonial structures while the Fremont did not.